Blue Rhino Studio specializes in interpretive design and artistic fabrication for museum, visitor center, and zoological environments. Over the last 22 years, Blue Rhino has become a leader for artistic quality and value in our industry. Our 16,000 square foot facility in Eagan, Minnesota is home to a tightly-knit creative team of skilled artists and craftsmen. We work in a wide range of styles, producing two or three-dimensional pieces on any detail level, and diverse exhibits that include sculpture, mural, carpentry and metal work with our full-time in-house staff. We are experienced industry experts whose constant focus is on quality; quality which is obvious in every project that leaves our shop. We are proud that our work stands out due to its consistent artistic excellence, craftsmanship, and attention to detail. "I recently had the pleasure of working with Blue Rhino Studio on our exhibition titled 'Mammoths and Mastodons: Titans of the Ice Age.' Blue Rhino built 10 large-scale animal replications for us. I have to say they are the best I have ever seen. Everyone who's seen them has been completely amazed. Throughout the process, I had more than daily correspondence with Blue Rhino to coordinate details with curators, illustrators, designers, and installation issues. Everything was worked out in a pleasurable, timely manor. I can only hope I have an opportunity to work with Blue Rhino Studio again." "Blue Rhino Studio exceeded all of our expectations in every phase of our large walkthrough diorama; from helping us value engineer our design, to collaboration with our in-house artists and content specialists. Visitor evaluation after the opening shows that visitors love Blue Rhino's work as well – our immersive Eocene diorama is by far the most popular part of our Fossil Mysteries exhibit!" "I always enjoy having the opportunity to work with Blue Rhino Studio. They do great work and are fun to collaborate with on unique and challenging projects. One of my favorite things is to make a shop visit. When the door opens into the studio area, I always get a big smile on my face. I am there to see what we are collaborating on, but I get to see all kinds of wonderful projects in various states of completion. An hour goes by pretty quickly and my schedule is blown for the rest of the day. However, the creativity and joy I experience make it more than worth it." "Blue Rhino's sculptors, artists and management were a dream to work with. 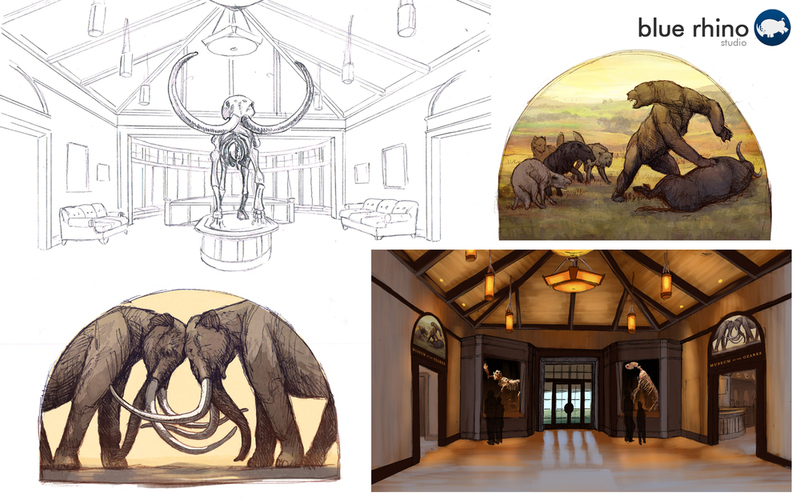 Their ability to capture the essence of our vision for the Eocene diorama's prehistoric creatures, plants and atmosphere was uncanny. The quality of their work is second to none. The sculptures of animals are the best there are. The full size Pterosaur, baby Mastodon and American Lion that Blue Rhino produced are mind blowing in their realism. I would not think of recommending anyone else."